Windy Nights | Kappa Kappa Kappa, Inc.
“Windy Nights” by Clarence W. Staley was the eleventh painting chosen for restoration. 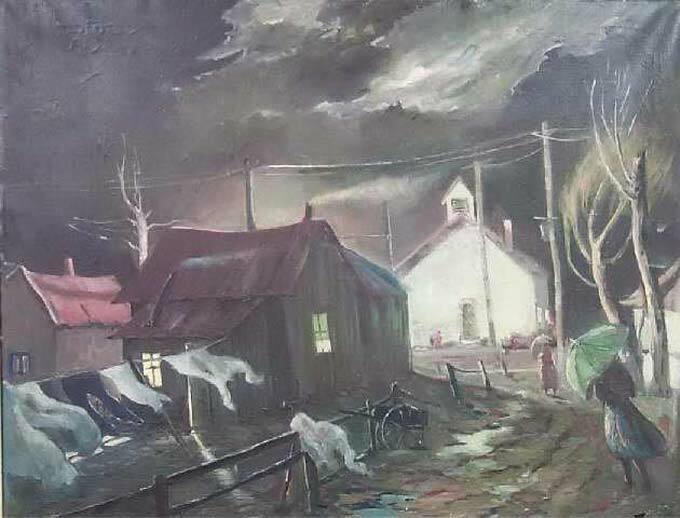 The painting measures 28”’x 36” and was purchased in 1947 for $600 with a current value of $3000. It depicts a rural evening landscape with two figures braced against the wind, walking toward a church. Laundry on the line blows against the wind at the rear of the house. Mr. Staley was born in Sindborne, Indiana in 1894 and began painting at the age of nine. When he was twelve, he passed a jury at the John Herron Art Institute exhibiting a small landscape. This jury was composed of J. Otis Adams, William Forsythe, and T.C. Steele. At that time young Clarence thought he was a full-fledged artist as a result of the encouragement given him by the judges. Later he had a few weeks of instruction under J. Otis Adams, but this was the most formal training he ever had. He exhibited with the Hoosier Salon from 1936 until the time of his death on July 1, 1946. Each year his pictures sold and he had pictures in Rockefeller Center in New York and in numerous colleges, libraries, schools, business offices, and homes in many states. His home was in Martinsville, and he made all the components that went into a painting including the frame, paints, and canvas. Other artists also used his homemade supplies for their paintings. Article submitted by Margaret Sherwood.